The School of Architecture conducted a two-day winter Programme on ‘GIS for Urban Design and Planning’ to expand the participants knowledge on the vast array of software’s that would enable them to excel and perform better in the field of architecture on 29th and 30th November 2018. The programme took its two day course through 4 informative, interactive sessions and 2 hands-on practical sessions handled by Mr. C. Selvaraj; Managing Director, Athira GeoSpatial Services Pvt. Ltd.; Mr. Karthigaiselvan R.; Manager, ESRI India, Chennai; and Mr. Akbar Ali K.; Technical manager, CADD Centre, Triuvanmiyur & Adyar, Chennai. Ar. Albert J. Hefferan, Asst. Prof. was the internal resource person. The program was attended by 75 participants including the pre-final year and under graduate students of the B. Arch programme and first year post graduate students from the School of Architecture, HITS. Mr. C. Selvaraj, Managing Director, Athira GeoSpatial Services Pvt. Ltd., Chennai, address on “Introduction to GIS”, introduced the participants to the concept of GIS and explained its various concepts through the use of live examples and on-going projects. The participants were introduced to all the concepts and official terminology used in GIS. The use of live examples made it easier to this understanding much easier. Ar. 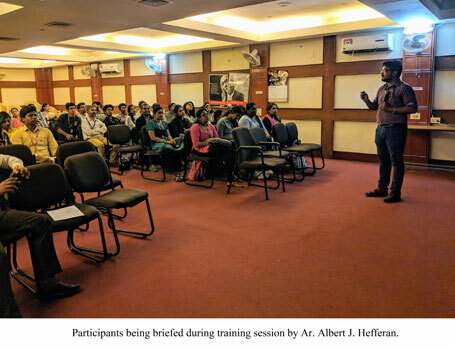 Albert J. H., Assistant Professor, School of Architecture, HITS’ lecture on “GIS in Architecture & Urban Design” briefed the problems faced by urban designers and architects in the field of data collection and representation were deliberated upon. The session ended with solutions that GIS could provide to overcome the same. The participants were introduced to the basics of ArcGIS 10.6 in this two hour session and were introduced to the basics of the concepts such as geo-referencing, shape files, etc. along with thumb rules that would help in making the use of the software easier. Mr. Karthigaiselvan R.; Manager, ESRI India, Chennai, spoke on “Advanced GIS Modelling”, in which he introduced the participants to the vast and varied array of analysis and simulations that could be performed using ArcGIS. The scope of ArcGIS, in the fields of Sustainable Developments, Smart City Infrastructure and Services provision, etc., was discussed with the participants. Mr. Akbar Ali K. Technical Manager, CADD Centre, Triuvanmiyur & Adyar, Chennai; deliberated on “Software’s for the Future”, in which he introduced the participants to the other software’s that an architect would need to know if the future, considering the fact that integration across various fields is becoming increasingly common. The participants were introduced to the various new software’s that were being used in the field, along with the increased amount of integration that is taking place in-between all fields related to the architecture and construction industry.